Welcome to a land of crafted oddities and snippets of writing projects and whatever else happens to seem worth tossing up from day to day. It's the opposite of faith / and I know these aren't the days / could you walk away? Chaoticly Creative .com - Blog! Pooka and troubadour, theoretical graduate in English, writing poetry, making... stuff, graphic artist and general dreamer. Done with me and seven of my friends, including two children. Click on the group shot below to see more picatures. Just took these at work and thought I would toss them up, as they are much nicer. 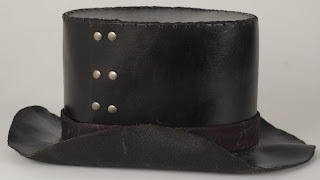 Second leather top hat is now created! This time in black, with a nice high-gloss finish. 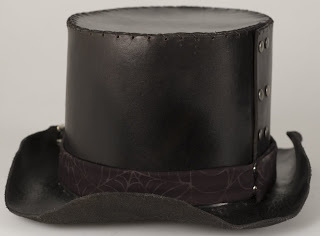 I shaped it a little more toward what I see as a ring-master style top hat. I'm sure I could find more technical terminology if I was interested in looking. 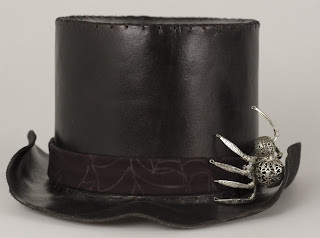 The real finishing touch on this, though, is the spider-web print hat band, which is nice and subtle and further accented by the metal clockwork spider pin on the side. 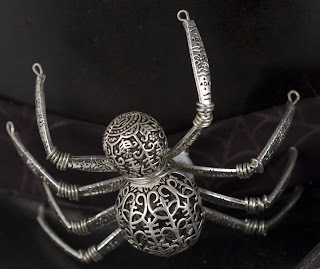 Side view on the spider side. Other side, again with the rivets. This will be listed on etsy soon, I just am not in love with the photos enough for such a major item. I may cheat and take some nice photos at work. So, the original plague doctor mask that I did is off this way. It eventually sold, which was nifty, and led to me creating the top hat. The top hat continue to be worn and be awesome and I even have plans for a second waiting in the wings for free time. The second go at the plague doctor mask led to me creating a Half Plague Doctor Mask. This was done as a lighter weight version of it. Amusingly enough, the same style of bird mask / plague doc mask shows up in Resident Evil 5. I won't go into the details on the character who wears, so as not to spoil anything, but it is interesting to see how often this particular style of mask shows up. Now, I am back at creating another full on mask, with a few of the lessons learned from the previous two attempts as a custom piece. It is coming together much more smoothly. Pictures to follow soon! Finished and shipped out this set of steampunk bracers for there wrists. They are done out of a nice brown leather. It has a thumb hole, rests just below the knuckles and goes down the arm. There is a small dart in the leather to give them more shape. Lots of antiqued eyelets. The lacing is black and gold, actually done with crocheted cord. On the bottom side are slots with metal brace bits to keep the wrist sitting properly. 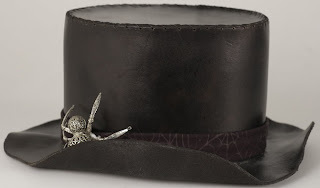 My latest obsession that kept me from finishing other projects was the leather top hat. Excitingly enough, another project actually for me. I do manage to go for those sorts of projects every now and again. I did a pattern out of poster board, based off of measurements and such. largely based off of me figuring it out as I want along, to be honest. Once that was reasonably what I was after, I pulled the mockup back apart and laid it out on my leather. I started with just plain old tooling leather. With pieces cut out, I used wool daubers to swipe on the dye, which let me get a more mottled effect. Which is totally awesome. Once that had dried, I did a quick wet seal on it. Basically running it under the faucet to rinse out any excess dye, then dried everything again between paper towels. That finished out, I played with options, and decided to put holes along the inside of the brim and the bottom edge of the main body first. Then I riveted the main body piece. I went with the double row of rivets for purely aesthetic reasons. Stitching or even a single row of rivets would have worked just as well. To stitch the brim in place, I wet down the inside edge of it and then flared it up a little before stitching to get it to sit more how I wanted. From there, I could wet the brim itself and play with shaping until I found the brim shape I was after. Which I actually found rather quickly after first toying. The top was originally going to have an amount of flare, but once I hit this point, I actually changed my mind and cut back the top piece and re-dyed the edges. I still had to stretch the top just a little to make things sit how I wanted, but the effect on the shaping is very subtle. I actually stitched the top twice. Once while wet for stretching, then pulled it out and re-stitched to get it tight and perfect. From there, I used a block out sealing layer. This didn't change the dye much, which is what I was after. The hat band piece I also did myself. It currently isn't attached quite how I intend to really have it, but I have not finished the hat pin I want to do. By which I mean, I haven't quite figured out what exactly I want for it. For the time being, I am just using a pin to hold the hat band in place. I intend to keep it removable, so that I can swap in alternate hat bands easily if I ever want to change things up a little. Probably I will add some little hook catches for that purpose. The band itself is some awesome fabric I found at a shop in Hawaii. (Yes, I went to a fabric store while on vacation on a tropical island.) I cut the strip and wrapped it around a semi-heavy bit of craft fuse stuff. I ironed it in place, then stitched the back edge by hand. I also folded over the one end and stitched that to give it a little nicer of an end piece. This is an idea that has been rattling around in my brain for a good two years now, if I'm not mistaken. I finally actually had a chance to visit a wood-working shop and pick out the bits and pieces necessary and with my additional free time, I've even started work on it. I picked out a piece of wood that I liked. I went more for the actual bit that felt right and looked fun rather then worrying much about species of tree. From there, I sat and whittled down the two end pieces so that I could get the handle and foot on. Multi-piece foot bit. The plastic bit is removable and shows a spike for more rugged hiking and what-have you. I went with the not quite as practical grip as well, since this is more a style thing. I used a little epoxy on both bits just to make sure they sat well. Two part putty epoxy, to be more specific. The top piece also has a small screw holding it in. The spike on the bottom I actually drilled a hole, and then actually bolted into it. So that bit seems like it should hold quite well. From here, I start adding symbols to it and play with how much bark is coming off and all. More photos to come!